The Enhanced Call Handling features include a User/Intercom Selector where you can choose the turboDial User for an Intercom Call or a Blind Transfer. That User/Intercom selector also displays the logged-in status indicator for each turboDial User in your company. turboDial uses information found in the User records in your Infusionsoft account to build the list of Users in the Intercom Selector. There are three important steps required for a User to appear in this selector. Step 1, a User cannot appear in the User/Intercom Selector until they have been authorized as a turboDial User in your turboDial Management Account. 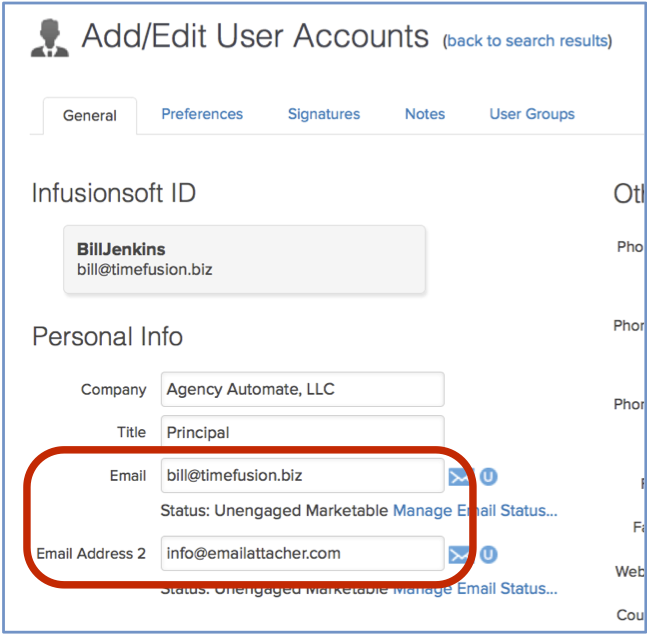 Step 2, the User Record in Infusionsoft must include the User’s Infusionsoft ID email address in either the “Email” field or the “Email Address 2” field. The User Records are located in Infusionsoft under the Infusionsoft Menu at Admin->Users. Once you complete this Step 2 the User can be found in the Intercom Selector and Intercom calls can be placed to their softphone. Step 3, if you also want a User’s direct phone numbers to appear in the User/Intercom Selector they must be included in the “Phone 1” or “Phone 2” fields of the User record. When the User’s direct phone numbers appear in the User/Intercom Selector those numbers are available to receive Intercom calls and transferred calls.